Adamstown is the only settlement on, and as such, the capital of, the Pitcairn Islands. Adamstown has a population of 49, which is the entire population of the Pitcairn Islands. All the other islands in the group are uninhabited. Adamstown is where most residents eat, drink and sleep, while they grow food in other areas of the island. The hamlet is the second smallest capital in the world. It has access to television, satellite internet, and a telephone; however, the main means of communication remains the ham radio. According to Google Maps, the only named road in the capital is called "The Hill of Difficulty". The history of the Pitcairn Islands begins with the settlement of the islands by Polynesians in the 11th century. The Polynesians established a culture that flourished for four centuries and then vanished. Pitcairn was settled again in 1790 by a group of British mutineers on HMS Bounty and Tahitians. 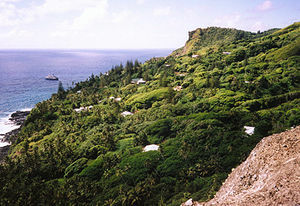 The settlement is located on the central-north side of the island of Pitcairn, facing the Pacific Ocean and close to the Bounty Bay, the only seaport of the island. Adamstown has a tropical rainforest climate under the Köppen climate classification system. The hamlet features a wet, warm climate averaging 1,700 mm (67 in) of rain a year. The wettest month is July and temperatures do not significantly vary throughout the year. ^ "Climate - Pitcairn Islands". Retrieved 22 September 2018. Wikimedia Commons has media related to Adamstown.